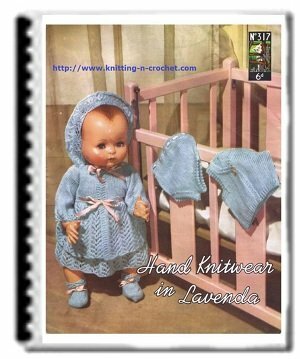 Here are some free doll clothes patterns for dolls in 3 different sizes 16 - 20 and 24 inch dolls. This dress, bonnet and bag is pretty and has a lovely design. These will make up so cute for a baby doll and they will be adored by the little mommy. Doll Size: To fit Dolls height approximately 40(50-60) cms [16 (20-24) ins]. 4 Ply. 90(120-150)g Main color (M), 20(25-30)g Contrast colour (C). 3 press studs for Dress. Length of narrow ribbon for Bonnet. 2 press studs for Bag. Using 2 1/4 mm needles and C ,cast on 175(199-231) sts thumb method and work 4 rows in garter st (every row knit). 1st row (right side): Knit. Rep the last 2 rows twice more. 7th row: K3, *yf, sl 1, k1, psso, k6; rep from to last 4 sts, yf, sl 1, kl, psso, k2. 9th row: K1, *k2tog, yf, kl, yf, sl 1, k1, psso, k3; rep from * to last 6 sts, k2tog, yf, k1, yf, sl 1, k1, psso, k1. Rep the 1st and 2nd rows 3 times. 17th row: K7. * yf, sl 1, k1, psso, k6; rep from to end. 19th row: K5. "k2tog, yf, k1, yf, sl 1, k1, psso, k3; rep from * to last 10 sts, k2tog. yf, k1, yf, sl 1, k1. psso, k5. These 20 rows form the pattern. Continue in pattern until work measures 18(23-28) cms [7(9-11) ins] ending with a purl row. Next row (decrease): Using C k1, *k2tog; rep from * to end. 88(100-116) sts remain. Using C work 3 more rows in garter st. Next row: Using M cast on 2 sts, knit these sts, knit to end. Next row: Using M cast on 2 sts, knit these sts, k2, purl to last 4 sts, k4. 92(104-120) sts. Next row: Using C knit to end. Next row: Using M k19(21-24), cast off next 10(12-14) sts, knit until there are 34(38-44) sts on right-hand needle after casting off, cast off next 10(12-14) sts, knit to end. Next row: Using M k4, p15(17-20), turn and work on these sts first for Right Back. * Working in stripes of 2 rows in C and 2 rows in M throughout and keeping the 4 sts at centre back in garter st, work 20(24-28) rows straight (work 1 more row here for 2nd side) thus ending at armhole edge. Cast off 8(9-10) sts at beg of next row. Work 1 row (omit this row for 2nd side). Slip remaining 11(12-14) sts onto a holder for neck edging. With wrong side of work facing rejoin M to next st, p34(38-44), turn and work on these sts for Front. Working in stripes of 2 rows in C and 2 rows in M throughout work 7(9-9) rows straight. Next row: P13(15-17), turn and complete this side first. * * Dec 1 st at neck edge on next 3 rows then following 2(3-4) alt rows. 8(9-10) sts remain. Work 5(5-7) rows straight. Cast off. Slip next 8(8-10) sts at centre onto a holder for neck edging. With wrong side of work facing rejoin yarn to neck edge of remaining 13(15-17) sts and purl to end. Complete as given for first side from ** to end. With wrong side of work facing rejoin M to next st at armhole edge and purl to last 4 sts, k4. Work on these 19(21-24) sts for left back. Complete as given for Right Back from * to end, working 1 row more and 1 row less where indicated. Using 3mm needles and C cast on 25(29-33) sts thumb method and work 9(11-13) rows in garter st.
Next row (increase): K1, inc in each st to last 2 sts, k2. 47(55-63) sts. Change to M and work in pattern as given for Back and Front until sleeve measures 10(12-15) cms [4(4 3/4-6) ins] ending with a purl row. Cast off. across sts on holder at front neck, pick up and k10(12-16) sts up right front slope and knit across sts on holder at right back neck. 50(56-70) sts. Work 4 rows in garter st. Cast off. Join back seam of skirt to bodice. Sew cast on edge of garter st border in place at centre back. Join sleeve seams leaving 6(8-9) rows open at top. Insert sleeves gathering fullness evenly across top of sleeve. Sew 3 press studs, even y spaced. to back neck opening. Using 2 1/4 mm needles and C cast on 95(111-127) sts thumb method and work 4 rows in garter st.
Change to 3mm needles and M and work in pattern as given for Dress until piece measures 9(11-13) cms [3 1/2 (4 1/4 -5) ins] ending with a wrong side row. Cast off 31(36-41) sts at beg of next 2 rows. Work in st st on remaining 33(39-45) sts until work measures 10(12-14) cms [4(4 3/4 -5 1/2) ins] from cast off sts ending with a purl row. Slip sts onto a holder. Finishing and Edging Join back seams. Neck Edging: Using 2 1/4 mm needles and C and with right side of work facing pick up and k18(21-25) sts evenly along lower edge to seam, knit across sts on holder as follows: k1, [k2tog] 16(19-22) times. and pick up and k18(21-25) sts evenly along lower edge. 53(62-73) sts. Sew a length of ribbon to each corner. Using 2 1/4 mm needles and C cast on 19(24-29) sts thumb method and work 4 rows in garter st.
Change to 3mm needles and working in st st, starting knit, work in stripes of 2 rows in M and 2 rows in C until piece measures 12(14-16) cms [4 3/4 (5 1/2-6 1/4) ins] ending with a purl row. Cast off.